Looking for private in-home or in-studio Tuba lessons? Our Tuba teachers are ready to get you started. Find your teacher today! The average cost of 60-minute tuba lessons is $62. While the exact cost will vary depending on the teacher, type of lesson, and your location, you should expect to spend anywhere between $15 and $130 per hour. For the best experience, we typically recommend 60-minute tuba lessons. However, students looking for a more affordable option may want to consider a shorter lesson length of 45 or 30 minutes. On average, 45-minute tuba lessons are 21% less expensive at $49, and 30-minute lessons cost 44% less at $35. Curious how much tuba lessons cost in your area? Do a quick search to get local prices for the best tuba teachers . Students are raving about their Tuba instructors on TakeLessons. Check out some of these recent reviews. t out to the student. I really enjoy the lessons I have with him and I feel that I'm becoming a better musician." om basic stuff like scales and other practices to what my goals are and how to achieve them. Working on line was no problem. Highly recommended!" ized what a valuable teacher I had. He was very supportive, and instead of making me feel like a failure in my mistakes, gave me the instruction and tools necessary to succeed. I wish my time with him had been longer, but I loved the short time we did work together." Bladensburg, OH teacher: Jeremy S.
s. By the end of the lesson, he was all smiles and feeling very confident about his ability to play a very hard piece for his solo contest. He is looking forward to his next lesson." ility and creates a lesson plan accordingly. His critiques, while kindly, are thorough as he strives to get the best out of students. My son enjoys the lessons and has improved in sound quality and technique. Web based lessons have worked out great for us as my son plays the tuba. Mr. Gallo has been flexible with the schedule which we appreciate. We highly recommend Mr. Gallo and the Take Lessons website/platform." "David helps a lot. My playing has been getting better every week." Cincinnati, OH teacher: David R.
Learn about rhythm, melody, harmony, and dynamics, and how they apply to the tuba. Explore the range of your instrument through various scales. Build solid skills through understanding the mechanics of how your body and instrument work together. Would you like to experience playing an instrument with a sound so big and deep that everyone will be sure to pay attention to you? If so, you should try playing the tuba. As you may or may not know, the tuba is the largest and lowest pitched instrument among the brass wind family. 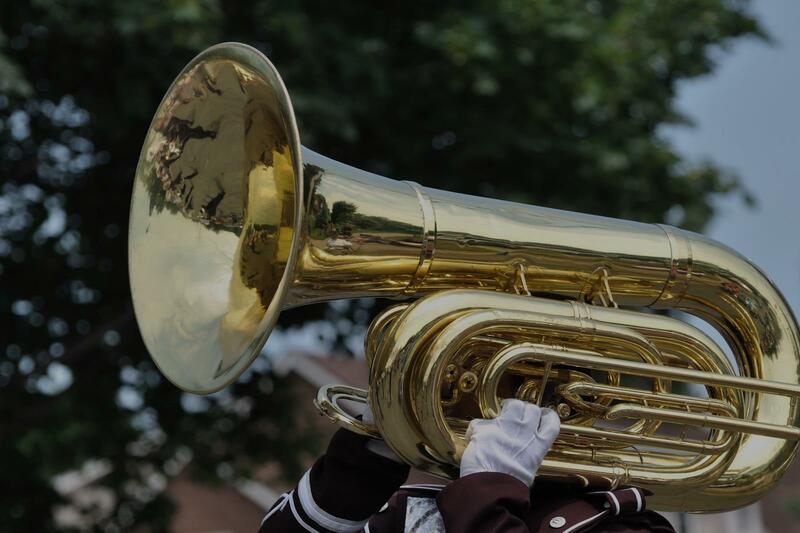 It may seem to be an uncommon instrument to play, especially in popular music, however the tuba has been widely employed in creating the distinct sound of drum and bugle corps, drum and brass corps, marching bands, concert bands, and jazz bands. The tuba can be somewhat difficult to play due to its size and the manner in which its sound is produced, but luckily tuba lessons exist so you can learn the knowledge required to properly play the instrument. By taking tuba lessons with us, you will learn the basic techniques required to excel with this baroque trumpet-resembling instrument.